I can't think of a song tie-in for this one... maybe something from Tron? I was debating whether even a screenshot's justifiable, given how little screen there is to shot. 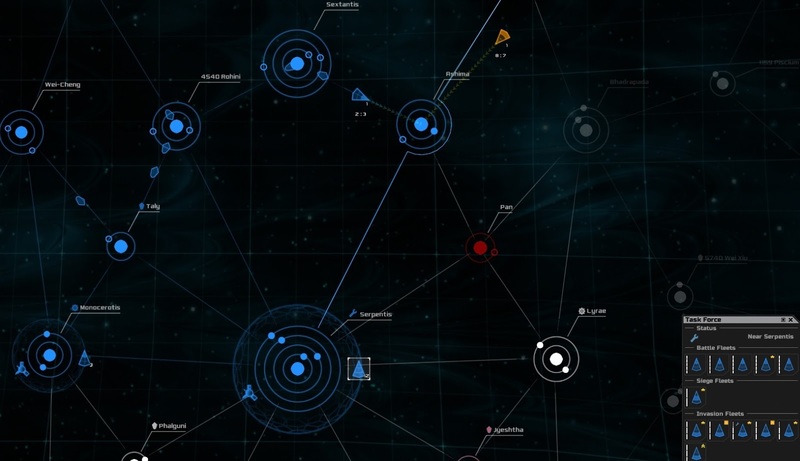 Yes, that's actual nail-biting interstellar fleet-on-fleet SciFi action right there, looking like the mere tactical minimap of most RTS games. I'd added Spacecom to my GoG wishlist some time ago. Now that I've shilled out a whole dollar for it on sale, I do wish I'd bought it years ago at full price while it was still "popular" for whatever definition of popularity applies to a 2014 game with 1980s graphics. In contrast to the despicable "neo retro" trend in adventure games and platformers and the like over recent years, Spacecom manages to stand on its own merit instead of merely banking on suckering in a few hipsters and nostalgic 40-year-olds trying to recapture their 8-bit youth by buying anything pixelated. -three types of nodes (solar systems) of various sizes, each capable of either producing your one resource, producing ships from that resource or repairing them. -three types of ships, for fighting other ships, destroying solar systems or capturing them. -three types of optional defenses for each system. Yet from those simple elements plus various patterns of linking nodes and the always thorny element of time arises that same sort of surprising complexity found in classic abstract strategy games like chess or Go. Play offensively or defensively, tentatively or decisively, scorch earth, steal supplies, stall and reinforce. Spacecom's lack of immersion comes with a lack of interference as well; unpretentious and streamlined, the interface delivers everything you need at a glance, clearly and intuitively. Though I usually prefer broader, more freeform activities, I could see myself jumping online for a half-hour match now and then with some regularity, were it still being played. Aye, there's the rub. This is obviously a multiplayer concept, and as it seems to have failed to build or maintain a critical mass of players, if you buy it now you'll be left pummeling the largely incompetent AI into submission until bored of its repetitive antics. For under ten dollars it's still worth it (especially as an example of clean, sober, focused, professional, no-frills game design) but I do slightly regret not having gotten in on Spacecom while the getting was good.